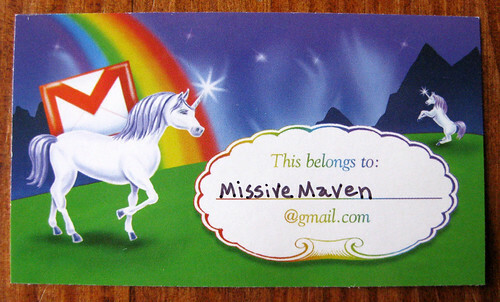 The Missive Maven: I got my unicorn gmail sticker after all! Remember when I was first excited about gmail stickers, and then when I received them I was totally disappointed? I lamented the lack of a unicorn sticker to any correspondent who could put up with it, for quite a while... because really, it was all about the unicorn. One very kind correspondent actually GOT a unicorn sticker and didn't even want it, or she took pity on me, and she sent it to me! Hooray! I will keep her nameless for the kindness, lest she be mobbed, but it made my day. 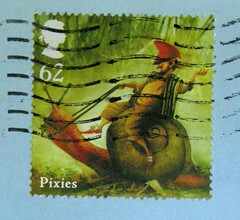 I mean, the unicorns are awesome, the rainbow is awesome - and even the little shell border for the address has a rainbow motif. 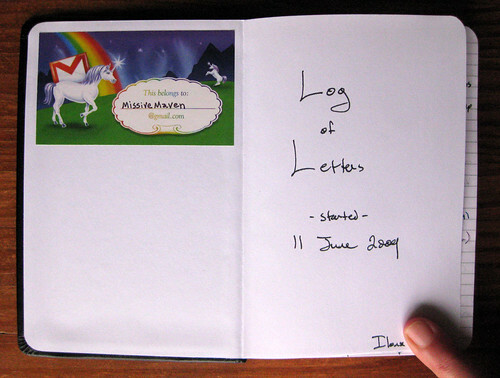 I gave it prime placement right at the front of my current letters log. how awesome is that I ask you ? I think you have some very nice pen pals and friends and readers Great blog and thanks for sharing . What an awesome unicorn fairy! You know, I think I found your blog from the Gmail stickers. I have hardly opened my own. They're too precious to do anything with.